A Facebook friend asked for input from lawyers about the Walmart v. Dukes opinion recently issued by the Supreme Court of the United States (SCOTUS). I'm still recovering from a series of 14 and 15 hour days as our state legislature rushed (for no apparent reason) to end the session by June 18. Except, it's not really ended, just on recess until July 13 (more on this topic on another day). My response to his inquiry is below. Nothing fancy. My brain is muffled in cotton. There were two major questions for SCOTUS to address in this case. First Question: I concur that the 9-0 vote on the procedural question, certifying the plaintiffs as a class, is not an issue. The group was far too large and lacking in commonality to certify as a class. The proposed class was too broad; it would have included every female Wal-Mart employee since late 1998, and it's a stretch to assume that they were all victims of gender bias. Second Question: However, SCOTUS split 5-4 on the question of sending the case back to the trial court to determine whether it could proceed in a narrower form. Justice Ruth Bader Ginsburg, a member of the minority on the latter question, warned that the Wal-Mart ruling would leave legitimate bias cases “at the starting gate.” Ginsburg, Sotomayor, Breyer, and Kagan all dissented from the majority on this second question. Ginsburg wrote the dissent. In other words, they must show that they are likely to win their case, to meet the “glue” test, a term that Scalia leaves undefined. What does it mean? How will it be determined that the "glue" test has been met? It appears that alleged victims of discrimination will, in the future, have to meet this test before they even will be allowed to certify as a class. It appears from the opinion that if discrimination is alleged in a wide enough variety of employment categories and locations, the plaintiffs cannot make a showing of commonality,without such a showing, they can't be certified as a class. The other legal analyses of this case that I've read conclude that such a standard makes the cost and difficulty of bringing a class-action suit virtually prohibitive. So the Wal-Mart employees who want to continue to pursue their case will have to sue the company individually, if they can afford to do so. Or they can give up. This is what all the concern is about, not the decision that there were too many members and not enough commonality to certify them as a class. In my legal opinion, the Supreme Court has increased the difficulty of seeking redress for illegal discrimination by employers through the use of class action lawsuits. The entire opinion, including the dissenting opinion on the second question may be found at: Walmart v. Dukes. Where do I begin? 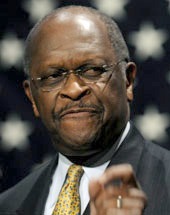 I thought that Sarah Palin was a scary person but Herman Cain is definitely in the same league. I checked out Cain's presidential campaign web site and I think that Palin writes his material. A verbatim example of his wisdom: To change the economic course of this nation, we must change the occupant of the White House, electing someone who understands the power of empowerment. What does that sentence mean? What is the power of empowerment? Just what this country needs, another politician spouting meaningless rhetoric. Another trait that Cain shares with Palin is that he also slept through civics class. According to news reports of his announcing his candidacy for president, Cain encouraged Americans to read the Constitution, admonishing us, “Keep reading,” he said. “Don’t stop at life, liberty and pursuit of happiness.” Herman, I hate to break this to you, but you're in the wrong document, the Declaration of Independence and the Constitution are not the same. Life, liberty etc.--that's in the Declaration. Cain's pontification on the righteousness of his homophobic bigotry sits well with his likely supporters. I don't believe that there is any entitlement to be a bigot. I know that there is no entitlement to impose your bigotry on the rest of us. Backing up bigotry with the Bible doesn't change anything; Cain is an ignorant man who spreads hate in the guise of personal morality. One of the most difficult truths for me to accept is that being a member of a group that has suffered oppression doesn't endow someone with any more insight into the evils of hate and discrimination than those that have traditionally played the role of oppressor. Nonetheless, it still assaults my sense of justice whenever a black person espouses a belief in the right to discriminate against some other traditionally oppressed group. I wonder if Cain recognizes that he is being used. Maybe he doesn't mind as long as the payoff is 15 minutes of fame. He's the perfect poster boy for the Right; a black man with business credentials who opposes government spending, supports big business, and waves his Bible while advocating for bigotry. The Right can point to him and declare, "See, we're not racists." Gee, makes me want to run right out and sign up as a Republican; hell, I may even join the Tea Party. Then again maybe not, after all, I have chores to do.